A Concise History of the Ark. The Ark of the Covenant like the Holy Grail has no direct physical evidence to support its existence. However, unlike the Holy Grail, there is much circumstantial evidence to support its existence. This circumstantial evidence does not come from the bible, but comes (mostly) from Egypt. Tradition says that Moses went up on Mount Sinai where God gave Moses the instructions on how the ark was to be constructed. Israel then carried the ark with them on their trek through the wilderness. The ark was kept in a tabernacle which was a tent used as the House of God. Then King Solomon built the Temple to house the Ark of the Covenant. Sometime after the death of King Solomon, and most likely before the destruction of the Temple by the Babylonians in 597 BC, the ark disappeared. To this day no one knows where it is, but there are many theories. So, there you have it a concise history of the ark. Now we will look at the circumstantial evidence that exists outside of the Islamic, Christian, and Jewish Holy books. First, Moses, (if he existed as stated in the bible) was an adopted son of the pharaoh of Egypt. As an adopted son he could not inherit the throne of Egypt. He was also the youngest son, so even if he had been a direct descendent of the pharaoh he would have been at the end of a long list of heirs to the throne. (For more on Moses I recommend reading the books of Genesis and Exodus in the Bible). In Egypt, other sons in similar situations to Moses became religious priests, and it is very probable that Moses was trained as a priest. Also, Moses’ father-in-law, Jethro, was a priest as well. Similarities Between Egyptian & Israeli Religion. Moses training as an Egyptian priest would account for similarities in religious rituals established by Moses for the new religion, and some religious rituals of Egyptian religion. The Egyptian god Aten translates into Hebrew as Adon and means Lord. The religion of Aten was a monotheistic religion, unlike the other Egyptian religions. The first recorded monotheistic religion of people. There are many more similarities between the two religions, including circumcision. The practice of circumcising males is of Egyptian origin and predates the Jewish tradition of circumcision. Even more telling is the description of the ark itself. An object common in Egypt at that time, arks can be seen in Egyptian art and have been found in tombs as well. 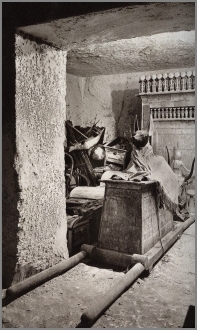 At the opening of King Tutankhamen’s tomb by Howard Carter arks of similar dimensions and design can clearly be seen in the photographs taken at that time. The Egyptians also had portable thrones for the pharaoh of similar dimensions with winged entities on them. 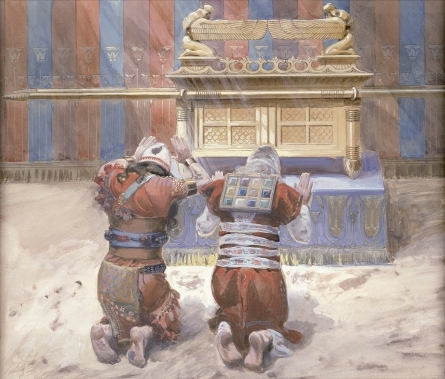 To the Israelites the Ark of the Covenant was a throne for God and the holding place of the Ten Commandments (along with other objects important to the Israelis), the lid for the ark was called the Mercy Seat, and God was said to meet the priests between the winged cherubim above the Mercy Seat. When Moses came down from Mount Sinai with the instructions to build the Ark of the Covenant, he had instructions for an ark that was Egyptian in its size, design, and appearance. He gave those instructions to men, Bezalel and Oholiab, who were familiar with building similar arks for Egyptians when they lived in Egypt. At the very least it would appear the story of Moses was adopted from Egypt. But, there was no need to just copy the story. The ark was a common and familiar item in Egypt and would have been familiar to the Israelis. The ark would have been easy to build by skilled craftsmen. There would be no reason to make up a story about the ark when it would have been so easy to build. As the Israelis were already used to seeing arks in Egypt, and used to them being associated with the pharaoh and with Egyptian religions, the Israelis would have readily accepted the Ark of the Covenant. The Ark is mentioned in the Islamic holy books just as with the Israelis and Christians. But, even more than that there is an indentation on the surface of the Foundation Stone of the World which is the same dimensions as the Ark of the Covenant. The Foundation Stone of the World is the large stone which rests under the Dome of the Rock on the Temple Mount. The Dome of the Rock is the third holiest site in Islam. Though the exact location of the Holy of Holies in Solomon’s Temple is not know, it is commonly believed that the Foundation Stone of the World was in the Holy of Holies, and that the Ark rested upon that stone. No archeological evidence exists to support the existence of Solomon’s Temple. It was Solomon’s Temple that was destroyed by the Babylonians in 597 BC. The Temple of Herod was supposedly built on top of the original site of Solomon’s Temple. The Wailing Wall in Jerusalem is the last remnants of the second Temple. The Wailing Wall is what had been the exterior western wall of Herod’s Temple. Herod’s Temple was built after Solomon’s Temple was destroyed and the Ark disappeared. 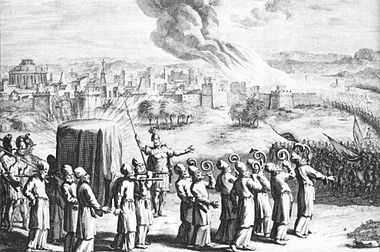 The second Temple was destroyed by the Roman’s during the Jewish Revolt in 70 AD. 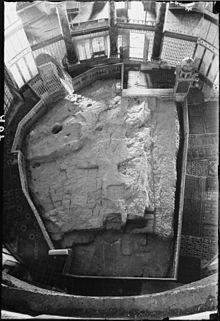 So, there is physical evidence for the second Temple (the Wailing Wall), but it does not provide evidence of the first Temple (Solomon’s Temple) or of the Ark of the Covenant. According to 2 Maccabees chapter 2 verses 4 – 10, the ark was hidden on Mount Nebo. 2 Maccabees is a book which appears in the Catholic bible, but is not in the Protestant bible. The Ethiopian Orthodox Church claims the Ark of the Covenant is kept in Axum in the Church of Our Lady Mary of Zion. A view also held by Graham Hancock, which is the topic of his book The Sign and the Seal. Ron Wyatt claimed to have found the Ark in an underground cave in Jerusalem. According to the Lemba tribe of South Africa and Zimbabwe, the Ark was taken to Africa by way of Yemen. The Ark, according to their oral tradition, self-destructed and the priests made a replica from the remains. That replica is now in the Museum of Human Science in Harare. Ah, now the Knights Templar. You knew they would make an appearance. According to French author Louis Charpentier the Knights Templar took the Ark to Chartres Cathedral. Still others believe the Ark was taken to the village of Rennes-le-Chateau in France, and then to the United States by Freemasons at the beginning of World War One. Several places in Israel, Rome, England, Ireland and even Egypt have been named as the final resting place for the Ark of the Covenant. There are some who believe the ark discovered in Tutankhamen’s tomb is not just similar to the Ark of the Covenant, but IS the Ark of the Covenant. An entire library would be needed to hold all the books that claim to know what happened to the Ark of the Covenant. But, the bottom line is no one has ever been able to produce the Ark of the Covenant. If found, the Ark of the Covenant would be the greatest archeological discovery of the century and maybe of the millennium, and could possibly start a new wave of Holy Wars involving Muslims, Christians, and Israelis. The best evidence for the existence of the Ark is circumstantial, but even circumstantial evidence fails to provide any support for the existence of the ark today. There are two groups of people who will strongly disagree with this article. The first group is those who believe that the Christian, Jewish, and Muslim religions are myths or fairy tales. Many of these people deny any physical evidence that supports Jewish people in the Middle East before the 20th century. The second group is some of those who are members of these three great religions. They will take offense at my comparisons to the Egyptian Cult of the sun god Aten. I understand the concerns of these two groups of people. However, this article was not written to debunk religion or to support religion. This article was written to take a look at the Ark of the Covenant as a physical, real, object made from common materials (gold and wood) by men. I have searched for evidence, physical or circumstantial, to support its existence in antiquity and today. I have found no hard physical evidence to support the ark ever existed. I have found considerable circumstantial evidence to support the ark did exist in antiquity. A very small amount of that circumstantial evidence has been presented in this article. And though many of the theories of what happened to the Ark are very interesting, none of them provide verifiable, hard, physical evidence to support the theory that the Ark exists today in the 21st century. Of the many theories on the disappearance of the Ark, I find Graham Hancock’s theory in The Sign and the Seal, to be the most intriguing. If the Ark of the Covenant does exist today, I believe it is within walking distance of the Dome of the Rock which is situated on the Temple Mount. No one knows when or how the Ark disappeared, it was just suddenly missing. I believe this supports the idea that the Ark was secretly taken from the Temple in the dead of night. This would explain the mystery. For the priests to be able to take the Ark without anyone being aware the Ark was missing, they would have had to take it at night, and would have had to been back before daylight. If it was known at the time when the Ark was taken, but the authorities had been unable to get the priests to tell where, then the record would be able to give us a date for the disappearance. But, it is a total mystery, which indicates that the only people who knew the Ark had been moved were the priests who moved it. The covered ark with golden staves carried by the priests, and seven priests with rams’ horns, at the Battle of Jericho, in an eighteenth-century artist’s depiction. This means they would have had to have returned before they would be missed. So, my conclusion is the Ark is within a short walking distance of the Temple Mount. If it does still exist, and is ever found, I hope for the sake of peace, the Ark is found only after Christians, Muslims, and Israelis learn how to peacefully live side-by-side.